There is a blog called We’re History that offers historical insights written by historians for the general public. I occasionally contribute. Today’s post was mine, about the Shaker missionaries to Kentucky in the winter of 1805. It’s quite a little adventure that helped make the Shakers among the most successful communal groups in American history. You can get to it by following this hyperlink. 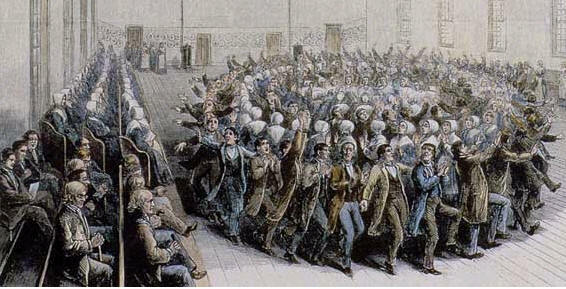 This entry was posted in U. S. history and tagged history, religion, Shakers on April 1, 2015 by Brian Bixby. You had me at Shaker. My dissertation work was related to the Shakers, so more such pieces will appear in time. I’ll be interested to see if you touch on the methods which made their furniture so well known. A possible future topic. Mind you, I’m not an expert on that topic, because the experts can even tell which village a Shaker chair came from! And the Shakers’ walks put my 12 miles into perspective. I didn’t even have sub-zero temperatures, although it did feel like it! Though they apparently never did better than 30 miles in one day. That Issachar Bates could do it is no surprise. But Youngs . . . it’s a wonder Bates didn’t have to carry him sometimes! Brilliant. And neither did I do it all in a leap. My first outing I had rest-breaks every 100 yds. My daughter (my walk-partner) was exceedingly patient with me. I think she was just pleased I hadn’t given in to the CFS. But it was a close thing. Amazing the difference just so far this year.